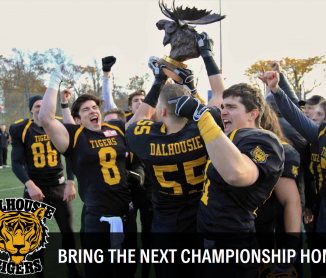 In 2016, the Dalhousie Tigers had a perfect season, 8-0 to win the Atlantic Football League championship. The 2017 season has proved to be inconsistent but still, the Tigers had a chance to have a perfect ending to this season. They defeated the 2nd place Holland College Hurricanes, 21-18 in one semi-final and advanced to play UNB’s Red Bombers in the final. The last time these two teams met in a championship was in 1953 as members of the Maritime Intercollegiate Athletic Union. The Tigers won on a muddy Studley field and star RB, Dave Bryson scored the only TD (when majors were 5 points) in a 10-5 victory. Bryson’s grandson, Nathan Whidden, is played in the final. The Red and Black of Fredericton overcame the Black and Gold of Dalhousie with a near perfect fourth quarter, scoring with 19 seconds remaining, for the 39-35 victory in probably the most exciting and best AFL championship ever. Not known for fast starts this season, the Tigers came to play! Dal rocketed to an early first Q, 14-0 lead on a masterful first drive, capped by Zack Leger’s three yard smash. On the subsequent kickoff, Turner Kinal stripped the returner and Gordon Brown fell on the ball in the end zone for the six. Ryan Merlin converted both scores to have the Tigers up 14-0 after five minutes of play. But the Red Bombers exploded! An Angus Van Wagoner pick setup Hunter Sturgeon, UNB’s QB with Cam Caisse for a 34 yard aerial major. The Tigers would go two and out and on the punt, returner Mitch McCoy off an initial inside sideline move juked wide for an electrifying 108 sprint for the tying TD. Early in the second quarter, Caisse scored his second on a two yard run and the Red Bombers took their first lead 21-14 as Kevin O’Sullivan converted all three. Late in the first Q, star RB Leger went down with a game ending injury and returning from injury backup RB, Zacchary Kuhn, filled in admirably. An excellent Kuhn kickoff return to the Dal 40, saw the Tigers march 70 yards for the tying major. Kuhn, the slash back of the early season, with O line blocking, picked up over 40 yards on 4 carries. The drive ended with Chris Duplisea hitting Ian Oyler for the ten yard major. Merlin’s PAT tied the score, but a late Q punt single by Jacob McNeil saw the Bombers with a 22-21 HT lead. The UNB Bombers continued to have short kickoffs in the second half. Dal’s return men were sure handed, giving the Cats good field position. Kuhn and Duplisea alternated carries four times starting at the UNB 44. Alistair Chauhan completed the drive with a 14 reception from Duplisea. This made for the sixth lead change or tie. Merlin’s convert and an O’Sullivan FG saw the game score, 28-25 for the Dalhousians. The Tigers were again given a short field. This time on a good punt return by Kenzie MacNeil which was aided by a devastating block by Kuhn. A UNB pass interference call on Jack Underhill gave the Dal squad a first and goal on the one. It seemed like an eternity as Tiger cracks at the goal line were stymied or Bomber offsides gave Dal further chances. Duplisea finally scored on a sneak and Merlin’s point saw the black and gold up ten, 35-25, early in the fourth quarter. A stalemate waged for the next four possessions, but the Red Bombers broke it open on an eight play march as Jason Cowperthwaite scored on an eight yard run. Two minutes and twenty seconds remained and Dalhousie was up, 35-32. Another O’Sullivan onside kick off saw Jason Watts again sure handed and the Tigers scrimmaging from their 51. Three plays later, a poor Dal punt, followed by a roughing the passer call, and a near interception by the Tigers had the Red Bombers in excellent field position for a tying FG. Two short runs by Tyler Sturgeon, set up brother Hunter’s three yard run for the game winning score. Bombers were now leading 39-35 with nineteen seconds remaining. Three incomplete passes later, a perfect ending to the game and the season had been stymied! Tiger Pride was front and center in the AFL playoffs. For the over forty returning players for 2018, this championship experience will bode well for next season and hopefully their fourth consecutive experience in the title tilt and second AFL crown in three years. GO TIGERS! To the dedicated parents who believe in the value of the education and football experience their son receives at Dalhousie University.